InstaGC is still very popular these days, but If you haven’t heard it before, you may wonder if it is a scam or legit program. InstaGC is one of the paid to click (PTC) site offered online today. So in this review, I will be going to reveal what this is all about and if it’s a legitimate way to make money online. If you want to make some extra money online, doing things online on sites like InstaGC can earn you money quickly and easily. InstaGC is a site where you can become a member and do online tasks like filling out surveys, searching on the web, playing video games, etc and they pay you for it. So if you like being online and like to surf the internet, why not get paid while you’re doing it? Recommended? : Yes, for pocket pennies. No, for full-time income. How Do You Earn With InstaGC? 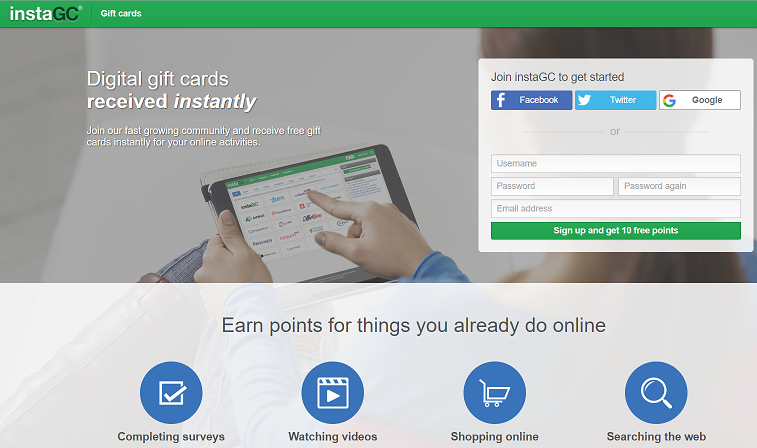 8 Ways To Earn Points With InstaGC. Is There A Bigger Money Maker? Earning extra money with InstaGC is quick and easy. It is a site where you can become a member and do online tasks like taking online surveys, searching on the web, playing video games, etc, and you will get paid for it. So if you love being online and enjoying to surf the internet, why not get paid while you’re doing it, right? InstaGC pays you in their currency first which are called Points. There are different types of tasks available on the site and these will allow you to earn points from 1 to 100 points at once depending on the available offers. Once you earn enough points, you can redeem your points with gift cards, therefore their site named InstraGC (Giftcards). Gift cards can be used through Amazon, Wallmart, Starbucks, Facebook, Online Games, etc. That’s pretty easy, right? That’s why many people love this site. They also have a low payout threshold of only $1 which is a hundred points for gift cards. When this is redeemed, you’ll instantly get the gift card code emailed to you and you can just use it right away. 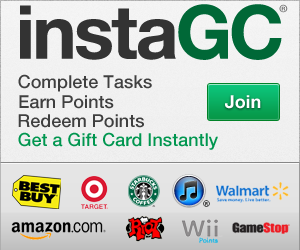 InstaGC has so many gift card options, hundreds just for the US alone, and they have more for other countries too. InstaGC offers payment like Bitcoin, Direct Deposit, eCheck, Ethereum, Litecoin, PayPal, and Visa Prepaid Credit Card BEFORE. However, these have different requirements, thresholds, and take a bit longer than getting instant gift cards – and these have cost a lot of issues. That’s why today, you can only use PAYPAL if you want to be paid in cash. Honestly, I’m very impressed to see the number of ways to redeem points because I’ve seen that many options for a PTC site so far. You can earn points here by downloading and installing apps on your mobile or tablet device. These are the 3 providers that you can participate at the time of this review. There is only 1 provider that offers for Calls at the moment of the review. This option will earn you points if you make qualified calls with the phone number specific to you. This is the most popular one and has a lot of opportunities here to earn points. All you have to do is visit and browse websites. Above are the providers that you can participate with. You will get instructions on what to do for each offer available here for each site you visit. You can earn points by simply downloading software, filling out surveys, etc. It can also be from searching on the internet, organizing brand names or labeling things. Above is the list of the providers that you can choose from. This option will earn you a lot of points for some offers you sign in. Doing this option will require you to give your personal information away and to subscribe to the different website. If you’re okay with all the junk emails, marketing SMS and phone calls – then you can earn a lot of points and will have so much fun with this. Just be careful with giving your financial information such as bank info and credit cards info. And be aware of the free trials or free gifts that will automatically enroll you to an expensive monthly subscription. The above providers are the ones who have this option at the moment. Watching videos and earning points at the same time? How cool is that? Well, honestly, not that much. You can play so many videos from 30 seconds to 60 seconds and then you earn 1 point like for watching 20videos. Oh, I personally don’t want to waste my time with this. Remember 100 points is $1. So, how many videos should you have to watch just to earn $1? Creating your own booster codes will earn you points for doing almost nothing. The codes will be randomly released on InstaGC’s social media pages and you redeem them to earn a few pennies. InstaGC also allows members to create their own codes to share with others to use them. However, you can’t promote member-created codes, you have to share their whole page/website where their codes are. When you create the codes, you must redeem or use points to be able to do so. The benefit is the traffic generated by the InstaGC itself by promoting your code so you get more referrals and earn points from it. InstaGC has honestly a good referral system. You can earn 10 points for each referral and you can earn 10% of your referral’s earnings, now that’s passive income! If you want to know how to get referrals like taught at Wealthy Affiliate Education, this is a great option and absolutely could be your real way to make the biggest passive income online. You will get a referral link you can share to tell people about InstaGC with so they can sign up with your link. PayPal as the mode of payout option. Point Booster Codes to get traffic by doing almost nothing. Customer service not very good. I can conclude that InstaGC is LEGIT and it’s a good place to earn money at. The earning potential is though very limited and this will not give you the real way to financial freedom online. However, if you just want a couple of hundred bucks per year by consuming several hours a day, then this is a good way to do it. But for someone like me, InstaGC tasks are not my cup of tea for earning money online because I don’t want to earn just pennies with my time. I’d rather spend time building an online business that I know is the real path to financial freedom. But of course, there are a lot of people who would be satisfied to earn online with some pennies. So, if you love the earning concept with InstaGC – feel free to Sign Up Here. The quick answer is definitely YES and I don’t waste my time on anything else but using it wise enough for a bigger option. 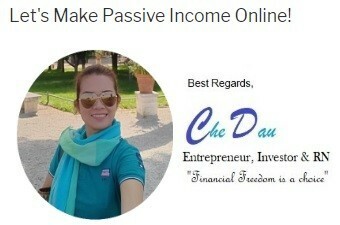 You can learn to do exactly the same and build a real online business that can surely create you a full-time passive income instead of trading a lot of your time on making pennies online. This online business model that I use is very easy to learn, provided that you have all the right business tools and proper training. Trust me, the sure way to achieve financial freedom online is through the right training and I’m fortunate enough to know where to get the best learning experience with full support from other experts who’s been successful at it before me. See how I earned up to $1,174.09 per day by doing a product review and how you too can do the same – with a step-by-step guide. This blueprint will lead you to the biggest and greatest adventure to finally learn the real way to make big money online that will change your life forever. Stop trading your time for pennies, take the milestone and start building a great thing towards earning thousands of dollars a month instead! I hope this InstaGC Review has enlightened you with any doubt you had. If you have any question or thought, please feel free to leave me a comment below. Good luck to your journey to financial freedom online. Wow, I thought it was going to be a big fat scam because it definitely sounds like one, however, you have clearly proven me wrong with all the facts you’ve outlined in this review. I think I’m going to give it a try seeing as it’s free to join and you can earn money instantly. Thanks a lot! It’s good that this review has enlightened you about the legitimacy of InstaGC. It is always great to be able to make money online, especially when it won’t cost any dime. Great review of InstaGC. I first time hear this band. In this review, the most important part for me is verifying InstaGC can really make money online. But unfortunately, it can only earn a little for few hours. It’s totally not time efficiency. If I want to earn a long term full time passive income and quit my job, it’s impossible totally rely on InstaGC. But for the student, I think it’s ok to earn pennies. Poor service is the main point too. If some problems happen in get paid, I can imagine what will happen with a poor service. It seems InstaGC is not my final way to earn money online. It should be a long long path in my life. Thanks for dropping by. You’re welcome. InstaGC is not really recommended for generating a full-time income online. And you’re right – this can be recommended for students or for anyone who just wants get some extra pennies in their pocket. In my opinion, services must be the most reliable part of any company.